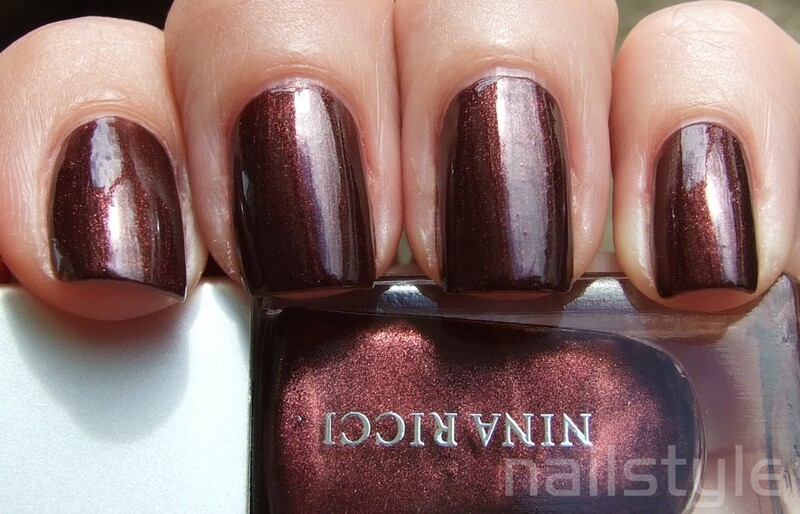 I recently recieved in the mail another boxed set of 5 Nina Ricci mini polishes. I had no idea these are considered 'high end' polishes until I saw that my little bargain for $15.00 actually had a RRP of $131.00! - for 5 mini polishes. Check out some of the other lovely colours here. Despite that, I can't recall seeing any other reviews of swatches of them on other blogs. Has anyone seen/used them?? Anyway, I'll keep on counting myself lucky to have scored a great bargain. This is Nina Ricci #18. The polishes don't have names, just a tiny number printed on the base of the bottle. This formula is effortlessly easy to apply and opaque in two coats. 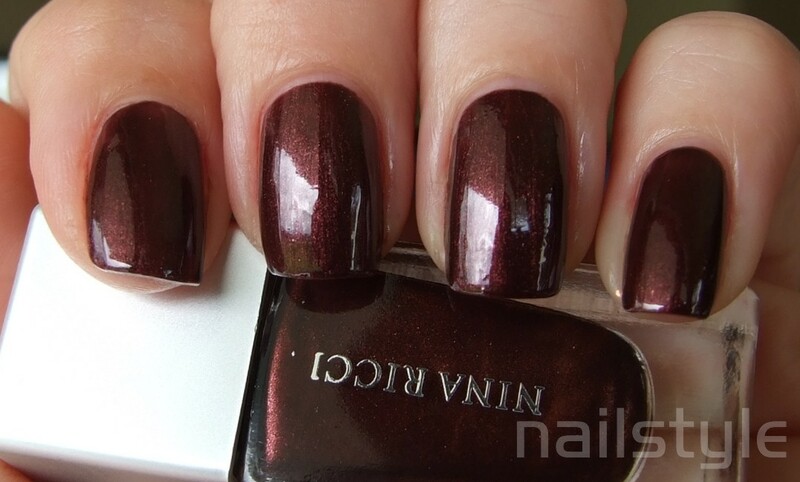 I would describe it as brown based burgundy with loads of gold shimmer. Onto the pictures . . .
Well, I'd say you got a fantastic deal. 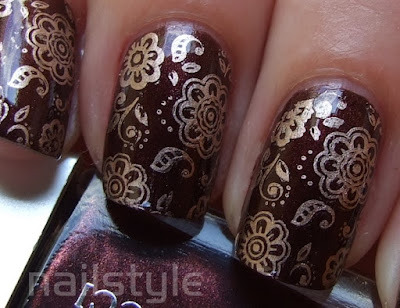 The stamping lovely. It's a very sophisticated look. 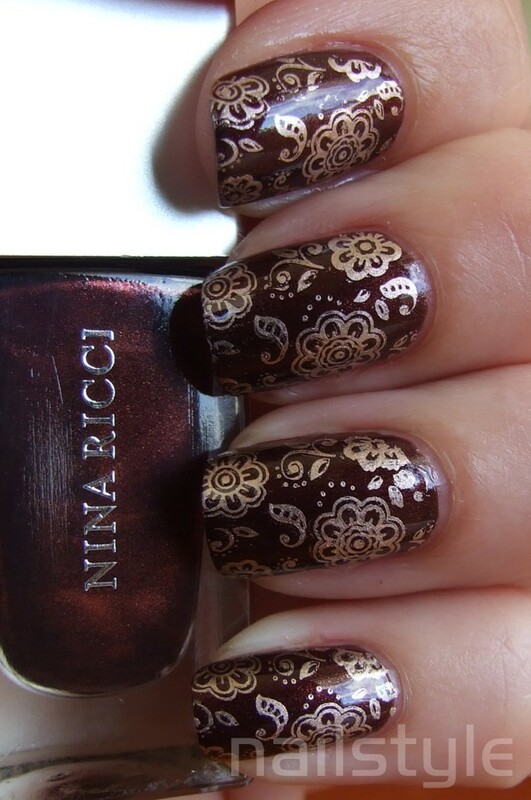 I love this stamp-just did a mani with it recently! Am loving these colors together! I didn't know Nina Ricci did nail polishes! It looks very nice! I love the stamping too!